The council has been forced to take urgent action after revealing that residents have reported more than 8,000 pot holes on roads throughout the borough. The recent freezing weather conditions has meant many road surfaces have deteriorated as water freezes and expands in cracks, making the surface crumble. Nearly £700,000 will be spent straight away to introduce new specialist ‘drive-through-and-fix’ crews to deal with potholes. Under the scheme eight specialist teams will sweep through the borough over seven weeks to find and fill them. The plans were unveiled at a meeting of the full council on Tuesday 2nd February. Ealing Labour condemned Ealing Council over shoddy road resurfacing across the borough, calling on the council to stop employing cowboy contractors who mess up our roads. Made worse by the recent cold snap, Transport Spokesperson Cllr Bassam Mahfouz read out a list of roads resurfaced in the last four years that are now falling to pieces during today’s Council meeting. He said workmanship has proved shoddy, with some roads resurfaced as recently as 2009 needing to be worked on again, causing even more disruption to the lives of local residents. Cllr Mahfouz said “They didn’t grit our streets and they don’t have a grip on sorting out our roads. What is the point of pouring money into poor quality road resurfacing when it gets washed away in the snow? They should stop employing dodgy contractors and start resurfacing our roads properly. 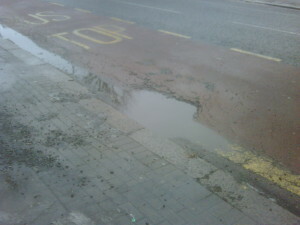 You can count on a future Labour Council sorting out your roads properly”. Other proposals include spending a further £6.5million from April to resurface scores of roads and pavements across the borough, matching last year’s investment. Councillor Jason Stacey, Leader of the Council, said: “I’m delighted that through sound financial management we are not only able to propose a 0% council tax rise next year, but we can also put forward plans for new investments and improvements to services. Plans to pump an extra £2million into adult social care to help the service cope with additional demands on it caused by the severe weather and the tough economic climate were also put forward at the council meeting. All budget proposals for next year will need to be discussed at a meeting of the full council on 9 March 2010.